Copyright © 2014 Xinming Yang et al. This is an open access article distributed under the Creative Commons Attribution License, which permits unrestricted use, distribution, and reproduction in any medium, provided the original work is properly cited. In accordance of the Creative Commons Attribution License all Copyrights © 2014 are reserved for SCIRP and the owner of the intellectual property Xinming Yang et al. All Copyright © 2014 are guarded by law and by SCIRP as a guardian. Objective: To improve the clinical differential diagnosis level, the clinical manifestation of the brucellar spondylitis and the spine turberculosis were discussed in this paper. Method: The study was completed in the No. 1 Affiliated Hospital of Hebei North University in Zhangjiakou City, Hebei Province, China, from January 2001 to December 2013. Analyze the X-ray, CT scanning and MRI of 257 cases of the brucellar spondylitis retrospectively and compare with the clinical imageology and pathology 332 cases of turberculosis of the spine diagnosed finally. Results: The brucellar spondylitis: The focuses usually locate in the lumbar vertebra and L4, 5 has the highest occurrence rate. The focuses are often small but multiple, and limited to the edge of the vertebra. Hyperostosis and osteoscterosis are usually found in the tissuses around the focuses. There are often new focuses in the newborn bones, and the destruction of intervertebral discs is usually slight. Hyperostosis and osteoscterosis might be found in the surfaces of the joints. The densites of the bones close to the focuses become high. There were less or no paravertebral abscesses but inflammational granuloma can be found frequently. Turberculosis of the spine: The focuses are usually located in the thoracic and lumbar vertebra, and are characterized by the destruction of the vertebra and the intervertebral discs, accompanied by the appearance of dead bones. In most cases, paravertebral abscesses and osteoporosis might be found. Conclusions: The specific manifestation of the clinical imageology can help to differentiate the brucelar spondylitis from the turberculosis of the spine. Brucellosis is caused by Brucella zoonotic infections allergic disease, the disease is often caused by the invasion of infectious spondylitis of the spine or discitis called brucellosis spondylitis, which is in clinical and imaging learn many aspects of spinal tuberculosis similar performance, easily misdiagnosed [1-6]. In recent years, with the increase of Brucella spondylitis disease incidence, epidemiology familiar with the disease, understand its clinical and imaging findings of its correct diagnosis is important. The author from January 2000 to December 2013 diagnosed and treated for brucellosis spondylitis 257 cases, 332 cases of tuberculosis of the spine, will analyze the following two clinical imaging and pathology. Comparison of Brucella spondylitis and spinal tuberculosis clinical, radiological and pathological features of the disease to improve the differential diagnosis of the two levels. Research done in China in 2000-01/2013-12 Zhangjiakou City, Hebei Province, the First Affiliated Hospital of Hebei North University. 1) with epidemiological history; 2) have spondylitis clinical manifestations; 3) imaging tests, including X-ray, Xray computer tomography (CT), magnetic resonance imaging (MRI); 4) laboratory tests, including serum tube agglutination test (SAT), brucellosis anti-human Immune globulin test, tuberculosis and other clinical specificity of the antibody serology; 5) pathology or pathologic examination including Polymerase Chain Reaction (PCR) and bacterial culture; 6) meet the diagnostic criteria for Brucellosis Endemic Disease Control Division Ministry of Health issued . Immature skeletal or malformations, immunosuppressive drugs, patients with spinal trauma or other diseases spinal surgery, history of other patients or spinal infections currently exists. 257 cases of Brucella spondylitis patients, 131 male, female 126 cases, aged 21 to 82 years, mean 46 years. All patients had varying degrees of sheep, cattle, or history of exposure to drinking unpasteurized dairy and eating raw beef sterilization, lamb history, including 135 patients living in endemic areas. Before admission underwent X-ray, CT and MRI, 216 cases done in the same part of the X-ray radiography 1 to 2 years ago and CT scans, clinical and radiological misdiagnosed as tuberculosis of the spine. After admission, 257 cases by the local Center for Disease Control and Prevention, prevention and control of communicable diseases standard serum tube agglutination titers were >1:160, rose bengal plate agglutination test (2+), brucellosis anti-human immunoglobulin test drops of l:400 above, PCR (+). 68 cases positive for pathogenic examination, 257 cases were confirmed by pathological examination of brucellosis. 332 cases of spinal tuberculosis patients over the past decade in the X-ray and CT, MRI examination findings and the clinical, laboratory, surgery and pathology confirmed 145 cases were male, female 187 cases, aged 17 to 78 years, The average 43-year-old. Of which 291 cases of patients with tuberculosis, gastrointestinal history of tuberculosis or history of exposure to tuberculosis. These patients were slow onset, fever, fatigue, night sweats, neck and shoulder pain, chest pain or persistent low back pain and lumbosacral pain may be accompanied by pain or numbness in limbs radioactive, muscle spasms, spinal movement is limited and limb multi-joint pain and other symptoms. 257 cases of Brucella spondylitis: 241 cases of two vertebral involvement, C3 42 cases, C4-5 10 cases, C6 73 cases, C7T1 1 cases, T7-8 1 cases, T8-9 1 cases, T9-10 1 cases, T10-11 2 cases, T11-12 4 cases, T12L1 6 cases, L1-2 6 cases, L3-4 59 cases, L4-5 94 cases, L5S1 51 cases; 16 cases three vertebral involvement, C4-6 2 cases, T8-10 2 cases, L2-4 3 cases, L3-5 6 cases, L4-5S1 3 cases; lesion distribution the following lumbar highest incidence rate, followed by L4-5 36.57% (94/257), L3-4 22.95% (59/257), L5S1 19.84% (51/257), most lesions involving the vertebral body to L4. The group of 192 cases of inflammatory infiltration of vertebral bone destruction and multiple small lesions confined to the edge of the vertebral body lesions around the obvious sclerosis, new bone tissue damage foci formation of another new, 41 cases with vertebral facet joint damage, 42 patients with paraspinal abscess formation, no sequestrum; inflammatory infiltration of the group of 204 cases of intervertebral disc, light damage, but it is easy to form the spinal inflammatory granuloma or abscess, including 152 cases of spinal cord, cauda equina or nerve root compression. 332 cases of spinal tuberculosis: Borderline 302 cases, 30 cases center; 286 cases of 2 vertebral involvement, C1-2 1 cases, C5-6 5 cases, T7-8 9 cases, T8-9 10 cases, T9-10 8 cases, T10-11 13 cases, T12L1 101 cases, L1-2 56 cases, L2-3 11 cases, L3-4 8 cases, L4-5 39 cases, L5S1 25 cases; 3 vertebral involvement 46 example, T7-9 4 cases, T8-10 5 cases, T11-12L1 21 cases, L2-4 6 cases, L3-5 7 cases, L4-5S1 3 cases. Thoracolumbar lesion distribution to the highest incidence rate, followed T12L1 30.42% (101/332), L1-2 16.86% (56/332), L4-5 11.74% (39/332), lesions involving the vertebral body is the most L1. 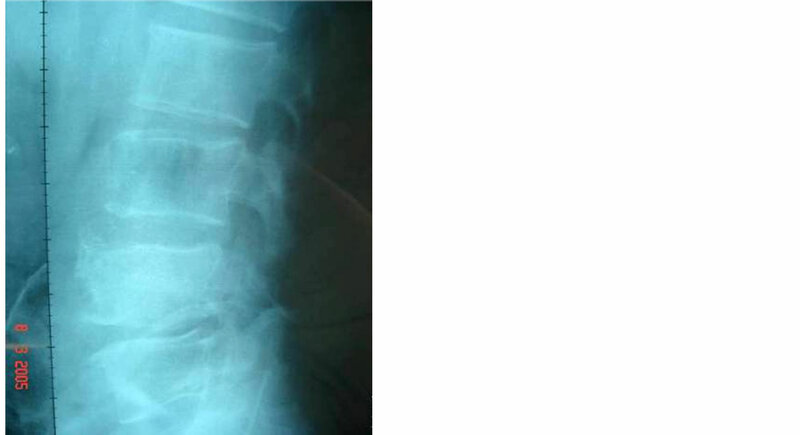 After the group of 332 cases of vertebral lesions confined to the upper and lower edges, and violations of the intervertebral disc and the adjacent vertebral bodies, intervertebral disc damage, disc space narrowing and sequestrum formation is characterized by common paraspinal abscess and osteoporosis, 286 cases of the formation of the spine convex, with little damage to the vertebral body attachment. Brucella a zoonotic disease caused by Brucella caused by sexually transmitted diseases, occurs in agricultural and pastoral areas in recent years, the global incidence is rising in some areas severe epidemic, the city significantly higher incidence, there are three main vulnerable populations, namely in agricultural and pastoral areas have a history of contact with sick animals; and laboratory staff in contact with the bacterial culture samples; been drinking unpasteurized dairy or sterilization standards eaten uncooked beef, mutton crowd [3,8-11]. Most vulnerable to the disease affects the spine, its epidemiology has evolved from a primarily career-related disease become a major food-borne diseases [10-14]. The more extensive tuberculosis, spinal tuberculosis mainly by tuberculosis, gastrointestinal tuberculosis or lymphatic system caused by spinal infection reaches the blood circulation. Brucellosis spondylitis clinical manifestations: 1) relaxation-type fever, fatigue, night sweats, loss of appetite, anemia; 2) associated with other organ infections, respiratory system and reproductive system infections as much, liver, spleen , swollen lymph nodes; 3) multiple, large migratory muscles and joint pain, L4-5 involvement of the most common; 4) persistent low back pain and lower back pain, localized tenderness, percussion pain, with severe neurological roots radiating pain or symptoms of spinal cord compression [10,15-18], muscle cramps, but no kyphosis, less psoas abscess formation, spinal limited mobility, often in a fixed position, has rarely epidural abscess caused paraplegia; 5) Laboratory tests: pathogen isolation, tube agglutination test, complement fixation test, brucellosis anti-human immunoglobulin test positive [4,10-12]; 6) surgical biopsy: noncaseous granulomas [8,11,17-20]. Clinical manifestations of tuberculosis of the spine: 1) afternoon fever, fatigue, night sweats, loss of appetite, anemia; 2) accompanied by other organs of active or old tuberculosis, tuberculosis in the lungs and kidneys as much; 3) to the thoracic spine The most common lumbar T12L1 involvement; 4) persistent low back pain and chest and back pain, local percussion pain, radiating pain associated with nerve root and the corresponding muscle spasms, mostly formed paraspinal or psoas abscess, kyphosis, sports disorder, often due to epidural abscess, sequestrum, cheese substance, tuberculosis granulation tissue necrosis caused by spinal disc compression and paraplegia; 5) laboratory tests: pathogen isolation, tuberculin skin test, tuberculosis antibodies [1,4,6,21]; 6) surgical biopsy: caseous necrosis [6,21]. Brucella and Mycobacterium tuberculosis infection and can invade any part of the spine [1,3,12,22], the former mostly in the lumbar spine, where the highest incidence of L4-5, the latter thoracolumbar majority, with the highest incidence T12L1. Figure 1. Female, 40 years old, Brucellar spondylitis from the L-3 to L-5. X-ray manifestations: marginal osteoclasia is mulifocality and looks like irregular worm-eaten changes or is an appearance like a knife or saw. The margine of the focus is clear and sharp and the density of the focus is the same as the density of soft tissue. The intervertebral space become narrow, the density become high and the surfaces of the superior and down inferior vertebral bodies become irregular, the tendency of bone destruction combined without dead bones. ter, the density is not uniform, and sequestrum formation, widened paraspinal soft tissue, normal muscle shadow blur, chronic cases seen a lot of calcification shadows; late vertebral compression into a wedge, the former narrow width, kyphosis. 2) Discitis: Brucella spondylitis group showed an early disc space narrowing, the density increased, but no damage to the vertebral endplates tendency (Figure 2); tuberculosis group showed progressive destruction of vertebral end plates and intervertebral discs density to reduce uneven intervertebral extremely narrow or disappear (Figure 3). Figure 2. Male, 45 years old, Brucellar spondylitis of the lumbar vertebrae. X-ray manifestations:the margins of the verbebral bodies become sclerified and hyperplastic and have formed bone spurs later like a beak which expand to the outside or the adjacent vertebral bodies and the ossification of the anterior and posterior longituinal ligaments formed bone bridges. The disappearance of the intervertebral space and the space of the small joints led to the secondary proliferative arthritis and the the bony ankylosis. Figure 3. Male, 38 years old, the tuberculosis of the spine from L-2 to L-3. X-ray manifestations: the marginal bone destruction of the vertebral bodies invaded the intervertebral discs and the lamina terminals of the vertebral bodies. The intervertebral space become narrow and the bone destruction is an osteolytic lesion and the cavitates can be found in the centre of the vertebral body. The density was uneven and dead bones formed, the kyphosis combined. Figure 4. Male, 42 years old, Brucellar spondylitis of the L-4. Manifestation of CT: there were multiple osteoclasia focuses around the vertebral bodies and there were obvious hyperplastic sclerotized strips around the focuses. New destructive focuses can be seen in the newly formed bones. Figure 5. Male, 40 years old, Brucellar spondylitis of the L-4. Manifestation of CT: New destructive focuses can be found in the newly formed bones of the right small joints and the hyperplasia and ossification of the left small joints can also be found. Figure 6. Female, 44 years old, Brucellar spondylitis of the L-4. Manifestation of CT: the density of the adjacent vertebral body of the pathological vertebral body—L-3 become commonly high and the periosteum right border of the vertebral body and the transverse process become hyperplastic and ossific. Figure 7. Male, 40 years old, Brucellar spondylitis of the L-4. Manifestation of CT: New destructive focuses can be found in the newly formed bones of the right small joints and the hyperplasia and ossification of the left small joints can also be found. Figure 8. Male, 42 years old, Brucellar spondylitis of the L-4. Manifestation of CT: Destructions of the interverbebral discs and the density of the interverbebral discs was isodensity and the hyperplasy and sclerosis of the articular surfaces can be found. The shadow of soft tissues beside the vertebral bodies was connected to the destructive areas of the vertebral bodies and the shape was irregular and the limit was clear. periosteal hypertrophy, bulging from the middle to the sides, like the vertebral body mottled uneven density increased, Clostridium deformed vertebra edge periosteal thickening, calcification, form a “lip” like osteophytes (Figure 12), plus the damage foci during freshman osteophytes constitute “lace vertebrae” of the characteristic performance (Figure 13), but between calcification and vertebral periosteum still legible. Adjacent vertebral osteophytes to form fused vertebrae side. Sometimes the performance of the transverse process of the periosteum top hat-shaped transverse thickening. TB group no such performance. Figure 9. Female, 39 years old, the tuberculosis of the spine of the T-12 and L-1. Manifestation of CT: Destructions of the interverbebral discs and the density of the the interverbebral discs was uneven. Swollen furuncled dead bones scattered in them and the articular surfaces were destructed irregularly. Figure 10. Male, 46 years old, Brucellar spondylitis of the L-4. Manifestation of CT: The psoas major muscles in both sides become wide in the plane where the vertebral body was destructed and in which the abscess emerged but not clear and the circumambient fat space is clear. Figure 11. Female, 29 years old, the tuberculosis of the spine of the L-1. Manifestation of CT: The shadow of the abscess of psoas major muscles was large and clear in which the calcification focuses were found and the abscess was larger than the vertebral body multiple-cavity disgorged abscess formed. Figure 12. Male, 38 years old, Brucellar spondylitis of the L-4. Manifestation of CT: the periosteum around the vertebral bodies got hyperplastic, pachyntic and calcific and formed osteophymas like lips. Figure 13. Male, 41 years old, Brucellar spondylitis of the L-4. Manifestation of CT: The neoformative osteophymas combined with the destruced focuses among them constituted the distinctive manifestation called lacy vertebral body. Figure 14. Male, 40 years old, Brucellar spondylitis of the L-4 and L-5. Manifestation of MRI: The pathological vertebral bodies and the intervertebral space were invaded by inflammatory matters. There was ill-defined soft tissue signal before the vertebral bodies and the spinal dura mater in the canalis vertebralis was compressed by the inflammatory granuloma. Figure 15. Male, 34 years old, the tuberculosis of the spine of the L-3 and L-4. Manifestation of MRI: Collapse of the pathological vertebral bodies, the kyphosis, destruction of the interverbebral discs, compression of the spinal dura mater by the necrotic intervertebral discs and dead bones, thin and smooth intensive abscess paries before or beside the vertebral bodies. Figure 16. Male, 44 years old, Brucellar spondylitis of the L-4 and L-5. Manifestation of MRI: The epidural abscess outside the canalis vertebralis formed and the characteristic was that there was no conspicuous local tissue reaction. vertebral endplates irregular bone destruction or disappearance, most accompanied by paraspinal abscess formation, and calcification within the common abscess, abscess often exceed the length of the vertebral lesion formation flow injection abscess, abscess edge signal enhancement [24,25]; tuberculosis of the spine is the most reliable MRI features “jump lesion” and thin and smooth abscess wall and enhanced well-defined paraspinal abnormal signal (Figure 17) [26,27]. The Brucella spondylitis and more involved in the lower lumbar vertebral segments and 1 - 2 [2,17], which is characterized by thick, irregular enhanced MRI abscess wall and ill-defined paraspinal abnormal signal, T1WI showed low signal, T2WI high signal to bone destruction evident when, T2WI high signal on fat suppression such as vertebrae, discs, accessories and intraspinal showed heterogeneous high signal (Figure 18) [2,3,28-31]. Figure 17. Male, 47 years old, the tuberculosis of the spine of the L-3 and L-4. Manifestation of MRI: The focuses were skipped and the vertebral bodies and the interverbebral discs were destructed. The thin and smooth intensive abscess paries and the abnormal well-circumscribed signal beside the vertebrae can be found. Figure 18. (a) Male, 43 years old, Brucellar spondylitis of the L-4 and L-5. (b) Male, 45 years old, Brucellar spondylitis of from L-3 to L-5. Manifestation of MRI: the thin and irregular intensive abscess paries and the abnormal ill-defined signal at beside the vertebrae—T1WI is low signal and T2WI is high signal. The vertebral bodies, intervertebral discs, accompaniment and the intra of vertebral canal are uneven high signal in the fat-suppressed sequence. Figure 19. (a) Brucellar spondylitis. By HE staining and the microscope of 10 × 20 multiple hyperplasy of the histiocytes in the focuses and the formation of the proliferating nodus and uncheesy granuloma can be seen in which there are a lot of histoleucocytes, homeocytes, neutrophile granulocytes, acidophilic cells and nodular focuses made of flaky epithelioid cells without dead bone tissues. (b) By HE staining and the microscope of 10 × 20 multiple hyperplastic lymph tissues that have formed folliculus lymphaticus can be seen. Figure 20. The tuberculosis of the spine. (a) By HE staining and the microscope of 10 × 4 multiple the even, red-stained and structureless tuberclers can be found and there was cheesy necrosis in the centre of the nodus and the epithelioid cells, Langhans giant cells, lymphocytes and plasma cells stellatedly spread in the peripheral areas. (b) The basophilous and trachychromatic chips of the dead bones and the degenerative fibrous connective tissues can be seen at the margin of the tubercles. cells and a small amount of proliferation of fibroblasts, There sequestrum organization tubercle edge visible sequestrum basophils stained tissue and degeneration of fibrous connective tissue (Figure 20). *2013 China Hebei Province key medical disciplines tracking project (GL201321); 2013 China Hebei Province, the provincial major medical research projects (zd2013049).